A "Great Gatsby"-themed party planned for the South Loop has been canceled amid a last-minute scramble to secure a venue. SOUTH LOOP — A big "Great Gatsby"-themed lawn party planned for the South Loop this month stirred online daydreams for thousands of Chicagoans. But like that green light at the end of Daisy's dock, the party will remain out of reach. 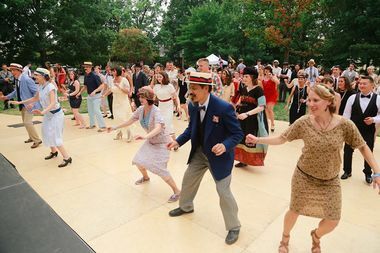 Nearly 9,000 people said on Facebook they were interested in attending "The Great Gatsby Lawn Party" planned for June 17 at Chicago Women's Park, 1801 S. Indiana Ave. More than 600 others said they would go. But the party isn't happening. Paul Ervin of Dardanella, the events company promoting the outdoor 1920s soirée, said the lawn party isn't coming to Chicago amid a last-minute scramble to secure a venue. Those who already paid $45 or $55 for tickets to the event will get a refund, Ervin said. "It's a very disappointing situation," Ervin said. Ervin said Dardanella drew big crowds to Gatsby parties at the Plaza Hotel in Manhattan and the Washington National Cathedral in Washington. The formula was simple and successful: guests showed up in Prohibition-era garb, sipped drinks and danced to the hits of the 1920s. "Today we have Crocs and Ugg boots and Uniqlo," Ervin said. "People like the idea of dressing up; they like to feel good in that way, and (the roaring '20s) invokes something." Ervin thought he could bring the party to Women's Park, but said he ran into red tape negotiating contracts with the Chicago Park District and other entities. Last week Ervin told DNAinfo he wanted to switch venues to the Field Museum, but by Tuesday admitted that he was running out of time to put together such a grandiose event on such short notice. Spokespeople for the museum and park district declined to comment. Ervin declined to disclose how many tickets Dardanella had sold for the event. He said information for those seeking refunds will be posted online soon.